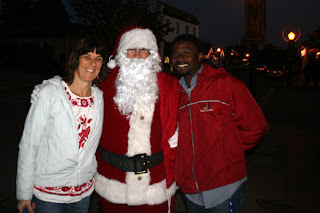 Andre & me in San Juan Bautista with Santa before watching La Virgen Del Tepeyac by Teatro Campesino in the Mission chapel, starring Luis Valdez as the bishop. 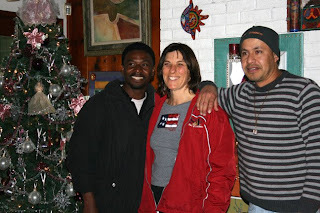 On the right, Andre, Daniel and I pose in front of the Xmas tree at Diane and Armando's house in Chula Vista, where the Becerra gals and friends prepared the traditional tamales on Noche Buena (below). 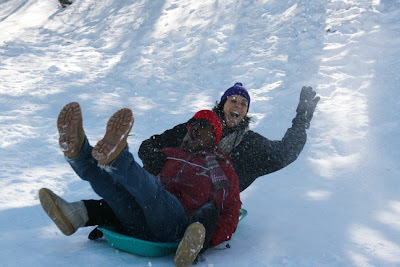 Andre's first sledding experience, in the Laguna Mountains of San Diego County. Andre's first time in the snow. 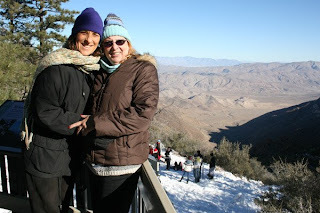 Vicki Finley Harley & I, overlooking the desert. 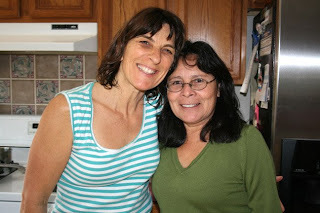 We've known each other since Mrs. McNary's kindergarten class at Rosebank Elementary. My nephew Hugh, his wife Shaya and their kids on Christmas Eve at Hugh's sister Tiese's house. Maya's biological grandma Carmen in San Diego. 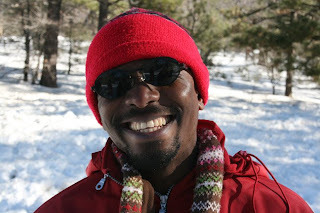 12/27/08 Greetings from the Laguna Mountains, one hour east of San Diego. Andre and Daniel are out stomping around in the snow -- another first for Andre. We're staying in a cabin at the Mt. Laguna Lodge with a childhood friend, Vicki, her 15-year-old son Alec and his friend Mike. Andre and I even have our own room. Vicki is busy cooking roast beef, ribs, potatoes and asparagus bernaise for dinner. Life is rough! We got on the road on Tuesday, Dec. 23 and drove straight through to Chula Vista. With 3 drivers and not too much holiday traffic, we cruised down quite painlessly, only stopping for food and gas. Andre and I got up early on Christmas Eve and went for a swim in the motel pool. 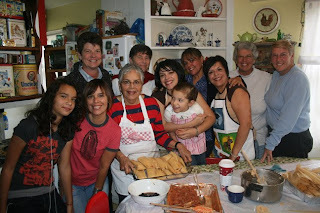 We dropped in on the Becerra women and friends as they finished up making the traditional holiday tamales. Andre and Daniel were the only men there for the first 15 minutes. I could tell they were getting bored, listening to the "gallinas" (hens) clacking away in the kitchen. Finally, they were rescued by Armando, the man of the house. On Christmas Eve we went out for dinner with my dad and his wife Judith and had a nice table right by the fireplace. Afterwards, we went to my niece Tiese's house. 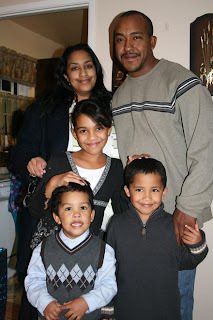 My only desire was to be with her two kids, J'Shon and Jayla, hoping not to miss Maya too much. But much to my surprise, they had a full house when we got there. It was filled with Charfauros', my relatives from my first marriage. I was so excited to see former sister-in-law Marian and her husband Eli, my nephew Vern and his girlfriend Angie, Marian's twin Alan, and my nephew Hugh with his wife Shaya and their 3 kids. In addition, there were lots of Tiese and Hugh's relatives on their dad's side. Too bad we were too stuffed to enjoy the feast they put out. Christmas morning I was surprised to see J'Shon and Jayla sleeping in late, probably because they already opened some of their presents on Christmas Eve. Andre, Daniel and I crashed out early, but when I woke around 3:00 a.m. to go to the bathroom, I found Tiese still cleaning up the kitchen and putting food away. I helped by cleaning the stove. The last guests had just left around 2:00. That might also explain why the little ones were slow to awake on Christmas Day. The big hit of the day was a complete rock band for their Wii game. The biggest rock star was Tiese's husband Jason. Hopefully, he'll let the kids have their turn sometime. We weren't expecting any gifts and we brought very few down, but what was cute is we got matching gifts. Judith gave us each a pound of See's Chocolates (YUM!) and Tiese gave us each a small digital alarm clock. The funny thing was trying to figure out whose was whose afterwards. You know my chocolates had the most left and Daniel claimed he'd set the time on his clock. We visited Jim Heiner, former Hilltop High School English teacher on our way up to the snow, and my long-time friend Mary on the way back. We stayed a night with Maya's bio-grandma Carmen and her family. As it turns out, Carmen got recently married too -- to her sweetheart of 20 years. Maya would have been so excited. We shared some of the leftover wedding cake (YUM!). It was so great to see Carmen and her daughters.